A glorious clusterf**k of a RINO calls it “a train wreck”. Makes ya wonder, eh ? McCain is visiting Italy’s Ambrosetti Forum, an annual gathering of political and business leaders, together with two fellow senators — Connecticut independent Joe Lieberman and South Carolina Republican Lindsay Graham — following a tour that took them through the Middle East. McCain cut a somewhat wistful figure at the proceedings — disarmingly accessible yet gravely ominous, a smiling, hard-headed reminder of what might have been. “In a way it’s almost like watching a train wreck,” he said of the apparent failure to stem Iran’s nuclear efforts. 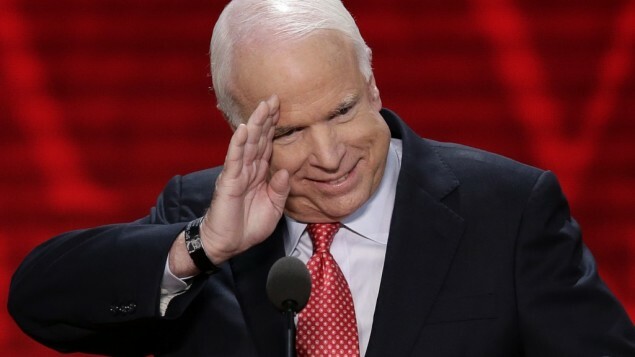 Here’s your “train wreck”, Senator McCain: “Preparing For A Post-Israel Middle East“. Somebody get that man a Headupinbuttectomy. This entry was posted on Saturday, September 8th, 2012 at 13:51 and is filed under The Constitutional Watch, The Media, The Second Amendment To The Constitution Of The United States..	You can follow any responses to this entry through the RSS 2.0 feed. You can skip to the end and leave a response. Pinging is currently not allowed. 5 Responses to A glorious clusterf**k of a RINO calls it “a train wreck”. My prayer is that open war can be forestalled until the inauguration of Romney in January. The United States will be supporting the proper side then. We can only hope and pray that Romney wins in November, otherwise I see Civil War on the horizon. Even if Romney wins the three months to the January Inauguration will be the most dangerous for America and Israel. I do believe that Obama is a one term President, though, of course, no on can be sure. I’m very concerned about the lame duck session, also. The Left made full use of it after the 2010 election. No reason to doubt that they won’t this time, either. We can only hope and pray that Romney wins in November, other wise I see Civil War on the horizon. Even if Romney wins, the three months to his January Inauguration will be the most dangerous for America and Israel.